This OpenWorld, Oracle’s x86 hardware team will have two hardware demos, showcasing the new X3 systems, as well as several other x86 solutions such as the ZFS Storage Appliance, Oracle Database Appliance and the Carrier Grade NETRA systems. These two demos are located in the South Hall in Oracle’s booth 1133 and Intel’s booth 1101. The Intel booth will feature additional demos including 3D demos of each server, a static architectural demo, the Oracle x86 Grand Prix video game and the Intel Theatre featuring several presentations by Intel’s partners. 2. 12:30 a.m. – The Oracle NoSQL Database on the Intel Platform. 3. 2:00 a.m. – Oracle Optimized Solution for Enterprise Cloud Infrastructure. 4. 2:30 p.m. – Configuring Storage to Optimize Database Performance and Efficiency. 1. I had the message already a couple of days added to the “Upcoming Public Appearances” sidebar on the right hand side of this page, now the official home page is available and registration open for the “CBO Days” at Trivadis 11th and 12th December in Zurich. 2. Oracle University is going to organize my one day master class “Mastering Parallel Execution” from December on. This seminar focuses on the building blocks of Parallel Execution: At the end of the day you should be able to really understand how Parallel Execution works, how to read Parallel Execution plans and in particular how to diagnose Parallel Execution issues like skewed data distribution using advanced tools like Real-Time SQL Monitoring and Active Session History. So after this session you should have the knowledge to fully leverage the power of Parallel Query and Execution. Ideally as a prerequisite you should already have a good understanding of serial SQL execution and how to read serial execution plans. If you are interested, get in touch with Oracle University so that they can plan accordingly. 4. The next “DOAG News” will include a accompanying article about “Cost-Based Optimizer Basics”, where I provide a summary of the Webinar contents. 5. And last but not least, after OOW rush is over I expect OTN to publish a mini-series on “Parallel Execution” that gives more insights into contents of the master class mentioned above. IN 2011, Oracle published document 1322888.1 “pscbo_stats – Improving Statistics in Oracle RDBMS for PeopleSoft Enterprise”. It takes a similar approach to my 10g package. A PL/SQL package is used to collect statistics. A number of tables control whether, when and how statistics are collected on each record. Oracle’s package is also intended to be used to collect schema-wide statistics. A document that describes the updated approach and the various scripts are available on the Go-Faste website at http://www.go-faster.co.uk/docs.htm#Managing.Statistics.11g. While Oracle OpenWorld may provide solutions and information on topics like how to simplify your IT, the importance of cloud, and what types of storage may satisfy your enterprise needs, who is going to tell you more about San Francisco? An image often associated with San Francisco, this bridge is one of the most impressive in the world. Take a walk across it, or view it from nearby Crissy Field, it is a sight that floors even the most veteran of San Franciscans. Located at the end of Market Street in the Embarcadero, the Ferry Building once served as a hub of water transport and trade. The building has a bay front view and an array of food choices and restaurants. It is easily accessible via the Muni, BART, trolley or by cab. It is a must-see in San Francisco, and not too far from the Moscone Center. For only $2, you can get go back in history for a moment on the Trolley. 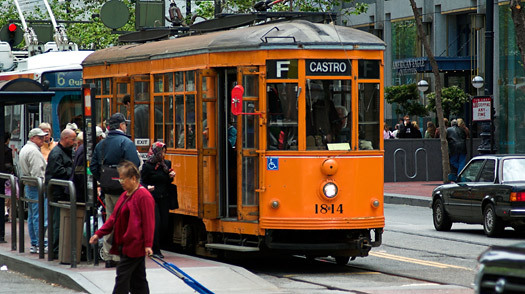 Take the F-line from the Embarcadero and ride it all the way to the Castro district. During the ride, you will get an overview of the landscape and cultures that are prevalent in San Francisco, but be wary that some areas may beg for an open mind more than others. When you tire of the concrete jungle, the lucky part of being in San Francisco is that you can escape to a natural refuge, this park being one of the favorites. This park is known for its hiking trails, cultural attractions, monuments, lakes and gardens. It is one good reason to bring your sneakers to San Francisco, and is also a great place to picnic. Please be wary that it is easy to get lost, and it is advisable to bring a map (just in case) if you go. 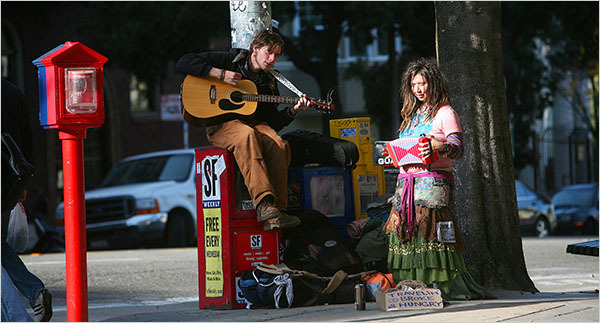 For a complete change of scenery, Haight Ashbury is known as one of the places hippies used to live and the location of “The Summer of Love.” It is now a more affluent neighborhood with boutique shops and the occasional drum circle. While it may be perceived as grungy in certain spots, it is one of the most photographed places in San Francisco and an integral part of San Franciscan history. Howard Street in San Francisco is closed. The large Oracle tent is up! Attendees are arriving by the plane load at SFO. It can only mean one thing …. That’s right! Oracle OpenWorld officially starts today with the Oracle Users Forum. Ton’s of great technical sessions selected by the Oracle User Groups get under way this morning at 8 am (Doh!). And of course, Larry’s keynote is this evening 5:00 pm–7:00 pm, Moscone North. A must see, as he is bound to make some exciting announcements to get the show started!